We spend the weekend in Lincoln to celebrate the Husbeast's birthday. We saw so many nice things and there will be a post about it soon. This to me screams spring and is such a happy colour. 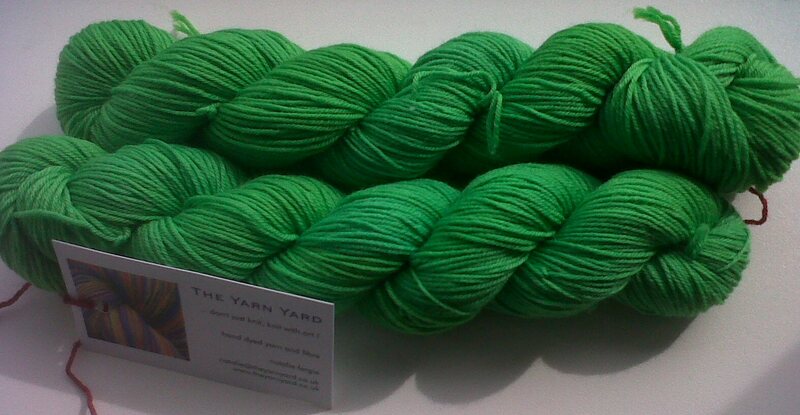 I don't normally "do" green, I own very little green yarn, clothes, fabric etc. I'm not sure why, its just not a colour I am normally drawn to. However this green is beautiful and I love it. I have absolutely no idea what I am going to do with it, it goes with nothing I owe, but I am reluctant to relegate it to socks when its such a happy colour. If you love the idea of the small skein society, get yourself over to Natalie's website pretty quickly as there are only limited spaces left. On the other end of the spectrum I got this beautiful dark blue yarn from Posh Yarn at the weekend. I have been really restrained with my yarn buying recently, however this really called to me. The yarn base is Martha which is a merino, cashmere and nylon yarn and really my favourite base. It is so soft and beautiful to knit with. If that wasn't enough to make me buy it, then the name was. Dee at Posh Yarn names all the colourways and her names are always inventive. This one is called "Dreams of an insomniac". Well I do suffer from insomnia, and it sometimes leads to the weirdest of dreams when I'm not quite properly asleep. What more justification do I need? In other news, I have been reading I promise. I've got a few weeks worth of book reviews to catch up on, a crafty creatives box to blog about, some new books and holiday photos. I'm hoping to have a bit more time, and the energy, to put them up over the next few days.